Photo Credit: From Sissi Michel Facebook Page. 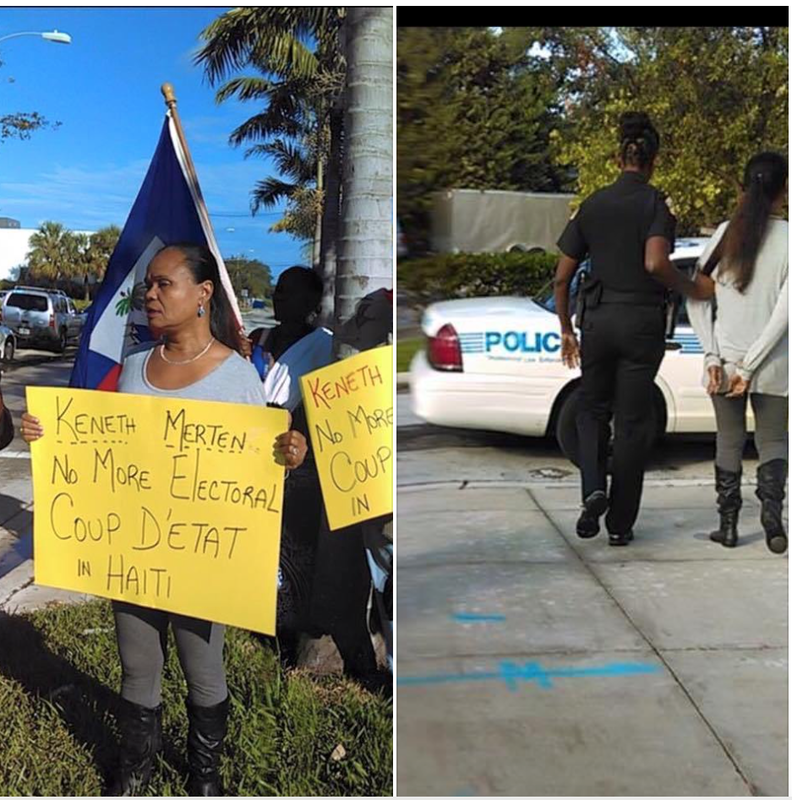 Haiti’s long-time social justice activist Farah Juste was arrested in Miami, FL while protesting against Haiti’s Conseil Electoral Provisoire’s (Provisional Electoral Council) presidential elections preliminary results. Sissi Michel a Haitian-born lawyer reported the arrest, on her Facebook page with Juste’s photo handcuffed. Michel wrote in French, “L’une des grandes dames de la musique haïtienne et militante Farah Juste arreté en Floride aujourd’hui lors d’une protestation pour critiquer les résultats des élections en Haïti.” She added, “Le droit de manifester est un droit guaranti par les lois locales et internationals. Since after the CEP announced the preliminary results for the Oct. 25 presidential, second round legislative and local elections, supporters of many presidential candidates such as Jude Celestin of LAPEH who was the front-runner according to polls prior Oct. 25, former Senator Moise Jean Charles Pitit Dessalines, Maryse Narcisse of Fanmi Lavalas and an additional four candidates. For two consecutive weeks, thousands of protesters have been protesting the streets of Haiti’s capital Port-Au-Prince, and other largest cities in the country against massive frauds registered during on Oct. 25 elections. They have demanded the electoral officials to investigate the frauds and to remove Jovel Moise, candidate of ruling party whose CEP’s preliminary results placed in first place, and announced he and Celestin will compute in the presidential runoff that will supposedly take place sometime in next month. The international community and international media praised the Oct. 25 vote as peaceful, as usual they have ignored the core problem which Haitian people have been denounced since the first round legislative on August 9. There were also reports of the involvement of United Nations worker involving in the Oct. 25 elections. Later Sandra Honoré, the United Nations Special Representative and Head of the United Nations Stabilization Mission in Haiti (MINUSTAH) in a press release denied those reports regarding the alleged involvement of United Nations Office for Project Services’ (UNOPS) employee’s involvement in the Oct. 25 electoral frauds. The International Community (IC) (including the United States one of the backers of the Michel Martelly administration) has remained silent since the protest began two weeks ago. The question that many have been asking, will the IC let Haitian people solve their problem? Or will countries like the U.S., France, Canada continue to play devil advocates in undermining democracy in Haiti? It was under President Barack Obama’s watch, and under influence of his then-Secretary of State Hillary R. Clinton, Haiti’s current President Martelly was elected in a controversial and flawed presidential elections. As Haitians long in the search for true democracy through fair, inclusive and democratic elections, may Haiti’s political leaders and the IC listen to them, and let their voice be heard. It is uncertain the second round presidential will take place in Dec. with protests in the streets. Although President Michel Martelly has vowed to leave office on February 7, 2016, it is unclear that Haiti will have a new leader ready to succeed him.